Finally, the opening of a project on which we had spent a long time in preparation, has arrived. Our vocation to cross-polinate disciplines met the creativity of Mikel Urmeneta, one of the founders of the company Kukuxumusu. 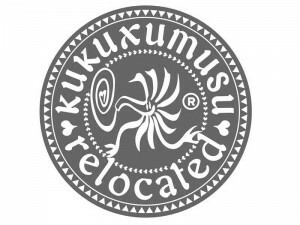 We are already working closely with the company in Mikel’s latest project, Kukuxumusu Relocated. 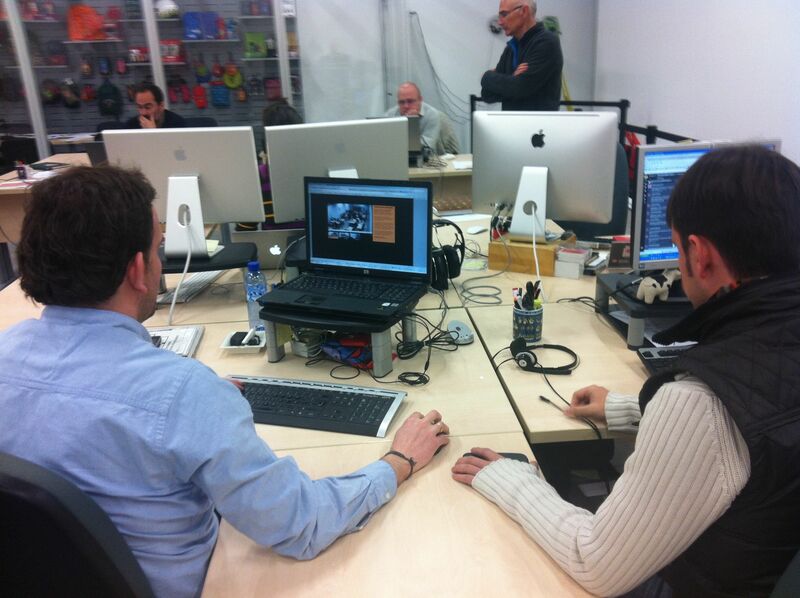 During two months, 22 Kukuxumusu workers will turn the Art Gallery Galería Moisés Pérez de Albéniz in Pamplona, north of Spain, into their workplace. Mikel launched a project with a strictly artistic goal. However, it opens up a significant opportunity to explore the organizational aspects behind it. 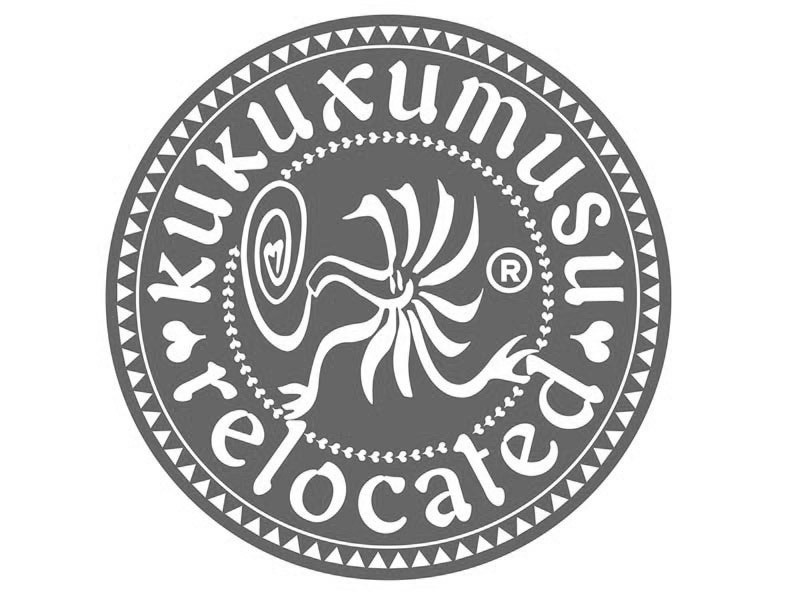 It is in this aspect where CoCreating Cultures is collaborating with Mikel and Kukuxumusu. 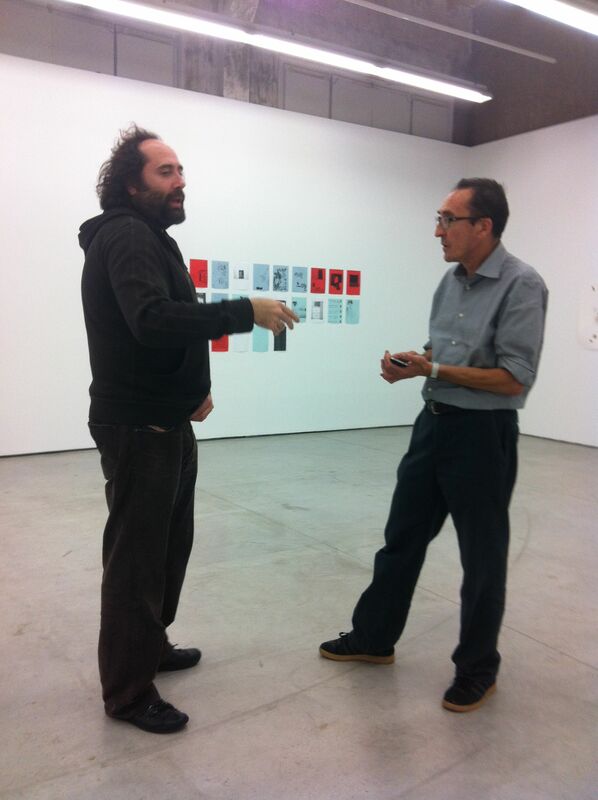 Mikel Urmeneta and Art History Professor Javier San Martin at the Gallery in late 2011, discussing how to approach the project. Photo: © CoCreating Cultures / La Mandarina de Newton. To transform a live company into a work of art to be exhibited in a gallery can be seen as a rather extreme extrapolation of the concept of ready made. Not to mention connections with interactivity, relational art, and other genealogies from the field of art. The exhibition is connected to the Internet. You can follow it around the clock. Simply go and watch camera 3 and you will learn about the details of negotiations between the management and staff in meetings with customers, suppliers and licensees, for example. The idea is has various artistic referents from Marina Abramovic to the Hikikomori Project: here (in Spanish) you find a few references. The interpretations of this experience are many and varied. To say nothing of this sort of moves in a time of widespread economic crisis, massive layoffs and job reductions. First steps in the "occupation" of Moisés Pérez de Albéniz Gallery, Pamplona March 20, 2012. Photo: © CoCreating Cultures / La Mandarina de Newton. 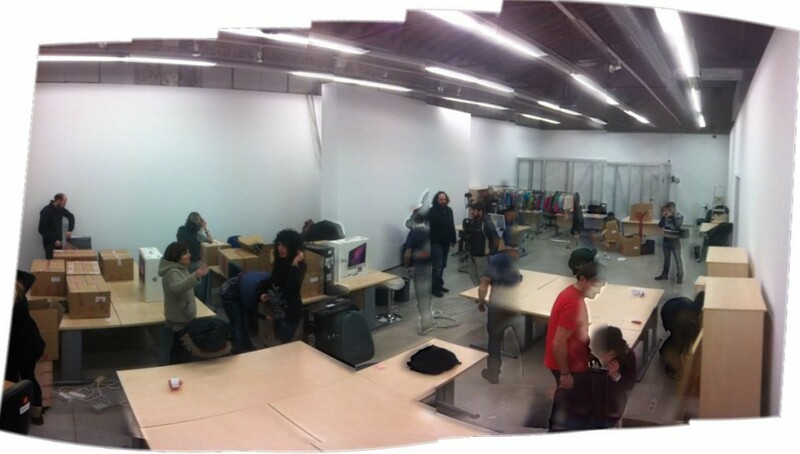 Remaking the workplace in Moisés Pérez de Albéniz Gallery. Photo: © CoCreating Cultures / La Mandarina de Newton. Distributing spaces, connecting tables. Photo: © CoCreating Cultures / La Mandarina de Newton. "Business as usual". On March 20, in just over four hours, all people are "relocated". In the background the "urn" where meetings are broadcasted live on the internet. Photo: © CoCreating Cultures / La Mandarina de Newton. From the organizational point of view, the intersection between art and business has happened many times. The field of “organizational aesthetics” explores the interaction between artistic and organizational processes for various purposes. Taylor and Hansen identified four different types of interactions as four different quadrants within a square where art and business were connected for learning and understanding the organizational dimension. In this sense it is a good field to explore interdisciplinary research. 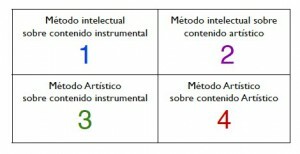 Quadrant 1 is of interest to academic studies of the organization. 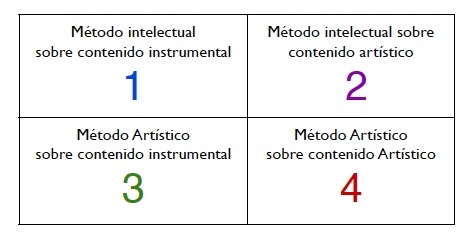 For example, it tries to understand a company from an artistic metaphor such as using the idea of jazz improvisation to understand and contrast coordination in the organization. Similarily theatrical performances (focused on power, ambition or other topics) have been used to explore together processes of organizational transformation. Analogously the organization has been understood as a continues set of interconnected stories that each member of a company tells to the rest. These stories frame important ideas of the culture of the organization about what the company is, how it is where you go, what types of relationships are given, how to be a “typical employee”, etc. Quadrant 2 works on the aesthetic realities of the organization and can be an art form by itself. For example, several anthropologists have used tools to represent their visual anthropology research on the effect of colors on a day to day business. Quadrant 3 focuses on using art forms to work on specific problems of a company. For example, an artist’s residence can to try to improve the innovation capacity of a company, or to help it rethink how to create a new strategy. Quadrant 4 creates art forms to present and trigger group reflection on the realities of daily life in the company. These artworks are created either by an artist in residence or by researchers in sociology and anthropology or between them and in collaboration with staff. It is has been used, for example, in mergers where the creation of small individual and collective diaries allowed to understand the meaning and the actual experience of change as lived by employees and, so, to orchestrate better the transition from the two separate companies into a single one, according to the expectations and values of each one. While this project seems to be focused on quadrant four, in fact, it is almost out of the whole square. Mikel Urmeneta connects his artistic action to the concept of transparency in business (although there are some opinions that require even more transparency from this experience). That may be a line of research but perhaps because it is so evident it will remain just that, a possible line of inquiry. We are beginning a research plan with the business team to fully explore Kukuxumusu possibilities for company-wide joint reflection. This relocation is a dislocation and creates a hiatus to think and design new ways to view and manage space, time, work routines, processes, relationships with the environment, self-image and visibility. We will keep you informed!.